For the song by Al Jarreau, see Breakin' Away (album). 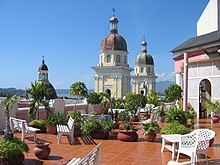 A roof garden is a garden on the roof of a building. Besides the decorative benefit, roof plantings may provide food, temperature control, hydrological benefits, architectural enhancement, habitats or corridors for wildlife, recreational opportunities, and in large scale it may even have ecological benefits. The practice of cultivating food on the rooftop of buildings is sometimes referred to as rooftop farming. Rooftop farming is usually done using green roof, hydroponics, aeroponics or air-dynaponics systems or container gardens. 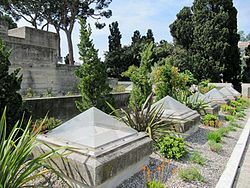 Humans have grown plants atop structures since the ziggurats of ancient Mesopotamia (4th millennium BC–600 BC) had plantings of trees and shrubs on aboveground terraces. 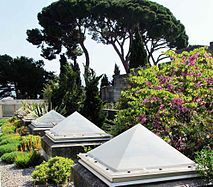 An example in Roman times was the Villa of the Mysteries in Pompeii, which had an elevated terrace where plants were grown. A roof garden has also been discovered around an audience hall in Roman-Byzantine Caesarea. The medieval Egyptian city of Fustat had a number of high-rise buildings that Nasir Khusraw in the early 11th century described as rising up to 14 stories, with roof gardens on the top story complete with ox-drawn water wheels for irrigating them. Among the Seven Wonders of the Ancient World, The Hanging Gardens are often depicted as tall structures holding vegetation; even immense trees. View of ACROS Fukuoka designed by architect Emilio Ambasz. 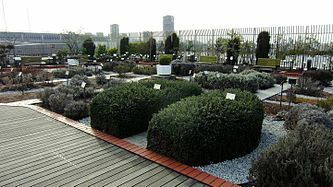 Roof gardens are most often found in urban environments. Plants have the ability to reduce the overall heat absorption of the building which then reduces energy consumption. "The primary cause of heat build-up in cities is insolation, the absorption of solar radiation by roads and buildings in the city and the storage of this heat in the building material and its subsequent re-radiation. Plant surfaces however, as a result of transpiration, do not rise more than 4–5 °C above the ambient and are sometimes cooler." This then translates into a cooling of the environment between 3.6 and 11.3 degrees Celsius (6.5 and 20.3 °F), depending on the area on earth (in hotter areas, the environmental temperature will cool more). The study was performed by the University of Cardiff. “In an accessible rooftop garden, space becomes available for localized small-scale urban agriculture, a source of local food production. An urban garden can supplement the diets of the community it feeds with fresh produce and provide a tangible tie to food production.” At Trent University, there is currently a working rooftop garden which provides food to the student café and local citizens. Available gardening areas in cities are often seriously lacking, which is likely the key impetus for many roof gardens. 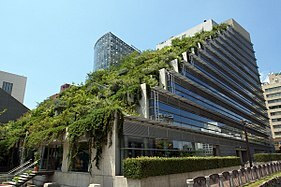 The garden may be on the roof of an autonomous building which takes care of its own water and waste. Hydroponics and other alternative methods can expand the possibilities of roof top gardening by reducing, for example, the need for soil or its tremendous weight. Plantings in containers are used extensively in roof top gardens. Planting in containers prevents added stress to the roof's waterproofing. One high-profile example of a building with a roof garden is Chicago City Hall. For those who live in small apartments with little space, square foot gardening, or (when even less space is available) green walls (vertical gardening) can be a solution. These use much less space than traditional gardening (square foot gardening uses 20% of the space of conventional rows; ten times more produce can be generated from vertical gardens). These also encourage environmentally responsible practices, eliminating tilling, reducing or eliminating pesticides, and weeding, and encouraging the recycling of wastes through composting. Singapore is active in green urban development. "Roof gardens present possibilities for carrying the notions of nature and open space further in tall building development." 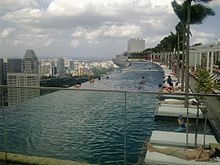 When surveyed, 80% of Singapore residents voted for more roof gardens to be implemented in the city's plans. Recreational reasons, such as leisure and relaxation, beautifying the environment, and greenery and nature, received the most votes. Planting roof gardens on tops of building is a way to make cities more efficient. A roof garden can be distinguished from a green roof, although the two terms are often used interchangeably. The term roof garden is well suited to roof spaces that incorporate recreation, entertaining, and provide additional outdoor living space for the building's residents. It may include planters, plants, dining and lounging furniture, outdoor structures such as pergolas and sheds, and automated irrigation and lighting systems. 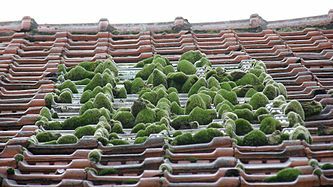 Although they may provide aesthetic and recreational benefits a green roof is not necessarily designed for this purpose. A green roof may not provide any recreational space and be constructed with an emphasis towards improving the insulation or improving the overall energy efficiency and reducing the cooling and heating costs within a building. Green roofs may be extensive or intensive. The terms are used to describe the type of planting required. The panels that comprise a green roof are generally no more than a few inches up to a foot in depth, since weight is an important factor when covering an entire roof surface. The plants that go into a green roof are usually sedum or other shallow-rooted plants that will tolerate the hot, dry, windy conditions that prevail on most rooftop gardens. With a green roof, "the plants layer can shield off as much as 87% of solar radiation while a bare roof receives 100% direct exposure". The planters on a roof garden may be designed for a variety of functions and vary greatly in depth to satisfy aesthetic and recreational purposes. These planters can hold a range of ornamental plants: anything from trees, shrubs, vines, or an assortment of flowers. As aesthetics and recreation are the priority they may not provide the environmental and energy benefits of a green roof. The related idea of a living machine is based on the most basic cycle of gardening: using wastes (organic waste and sewage), appropriately broken down, usually in some specialized container, on the soil, and harvesting food which, when processed, generates biodegradable waste, and when eaten, generates sewage. In most of the world, this kind of very tight closed loop gardening is used, despite certain health risks if necessary precautions are not taken. Composting human or pet waste should achieve thermophilic conditions and age for at least a year before being used. American jazz singer Al Jarreau composed a song named "Roof Garden". Apu Nahasapeemapetilon of the TV show The Simpsons has a roof top garden visited by Paul McCartney and his wife. In BBC's 1990 television miniseries House of Cards, the main character, MP Francis Urquhart, murders journalist Mattie Storin by throwing her off of the Palace of Westminster's rooftop garden. ^ Louise Lundberg Scandinavian Green Roof Institute (2009). "The benefits of Rooftop Gardens" (PDF). Retrieved March 12, 2014. ^ "World's Largest Rooftop Farm Documents Incredible Growth High Above Brooklyn". The Huffington Post. February 12, 2014. Retrieved March 12, 2014. ^ Michelle Nowak (May 2004). "Urban Agriculture on the Rooftop". City Farmer, Canada's Office of Urban Agriculture. Retrieved March 12, 2014. ^ pp. 112–115, chapter 2, "Roof gardens through history", Roof gardens: history, design, and construction, Theodore Osmundson, W. W. Norton & Company, 1999, ISBN 0-393-73012-3. ^ p. 219, Byzantine garden culture, Antony Robert Littlewood, Henry Maguire, and Joachim Wolschke-Bulmahn, Dumbarton Oaks, 2002, ISBN 0-88402-280-3. ^ Catherine Brahic (September 28, 2007). "Cooling percentages by 'Green roofs'". New Scientist. Retrieved March 12, 2014. ^ a b Liu, K. "Energy efficiency and environmental benefits of rooftop gardens" (PDF). National Research Council Canada. Retrieved March 12, 2014. ^ Trent University (October 30, 2009). "Rooftop Gardens" (PDF). Retrieved March 12, 2014. ^ "What to Consider When Designing and Building Your Own Rooftop or Balcony Garden - Projex Group". Projex Group. 2017-11-17. Retrieved 2018-05-23. ^ a b c Yuen, B, & Wong, N. (2005). Resident perceptions and expectations of rooftop gardens in Singapore. Landscape and Urban Planning, 73 (4). Retrieved June 19, 2009, from ScienceDirect database. ^ Zimmerman, Greg. "Extensive or Intensive? Green Roofs Explained". Retrieved 17 January 2017. ^ Wong, N, Tay, S, Wong, R, Ong, C, & Sia, A. (2003). Life cycle cost analysis of rooftop gardens in Singapore. Building and Environment, 38 (3). Retrieved June 19, 2009, from ScienceDirect database.